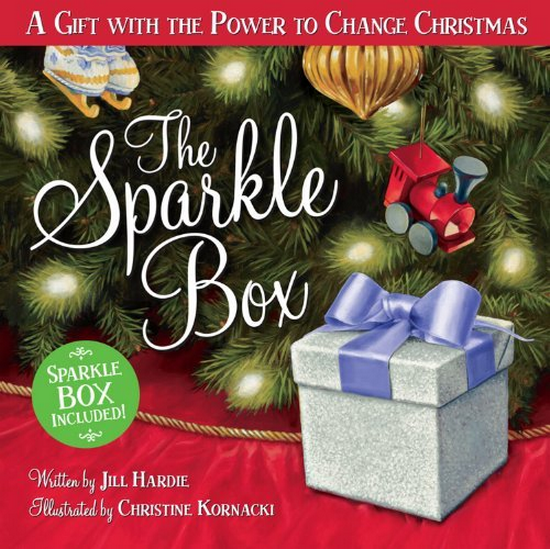 I read the children’s book titled “The Sparkle Box” this past weekend and found it to be a perfect Christmas gift for children and young families. The story is about Sam finding a special box on the fireplace mantle and asking questions about it. His mom points out that the whole family will open it together on Christmas Day, but it first needs to be filled with a few special things. Sam’s exploration of what items were to be added to the box was refreshing and childlike. The incredible illustrations supplemented this wonder and encouraged the reader to follow Sam through his particular actions that brought about hope, faith and peace. The story was heartwarming and gave me the desire to put a sparkle box in my living room this Christmas season. Author Jill Hardie wrote from the heart and her own family’s sparkle box experiences with the goal of refocusing her family away from commercialism, to the real meaning of Christmas. Christine Kernacki did a great job illustrating the book with her love for painting and desire to bring stories to life. I was amazed at how many moments in the story I could relate to based on my childhood and family experiences. I found it to be the perfect story to help families develop a new tradition that includes adding a sparkle box to their Christmas decorations. Entries must include YOUR NAME, STREET ADDRESS, PHONE NUMBER, and YOUR ESSAY. I will select one winner on November 1, 2012. The selection criteria are simple: I will select the one essay that touches my heart. If I’m touched by more than one, then I will draw a random winner from a hat.